Far from my very first impression once landing in Sai Gon, which is known to be always full of sunshine, coconut and rainy season, Sai Gon is covered with more green space, nice people, fruits everywhere and more importantly, delicious food. One will find no difficulty coming across a street vendor selling a very special kind of food with guaranteed tasty flavors and sanitation. Indeed, Sai Gon, as the title suggested, is a wonderful paradise of street food where both locals and foreigners can’t help lingering for a while not only to hide from tiredness and sunny weather, but also to enjoy authentic specialties made by talented home-cook during their stay in this pearl of the Far-east. Sai Gon in early April is featured by intense hot with the temperature during the day of around 38 degree Celsius, however, in the evening, it is blessed with mild and windy weather, especially near the river bank or channel. Such places are always crowded in late afternoon till night with thousands of restaurants, street food stalls, café and many other kinds of live activities. 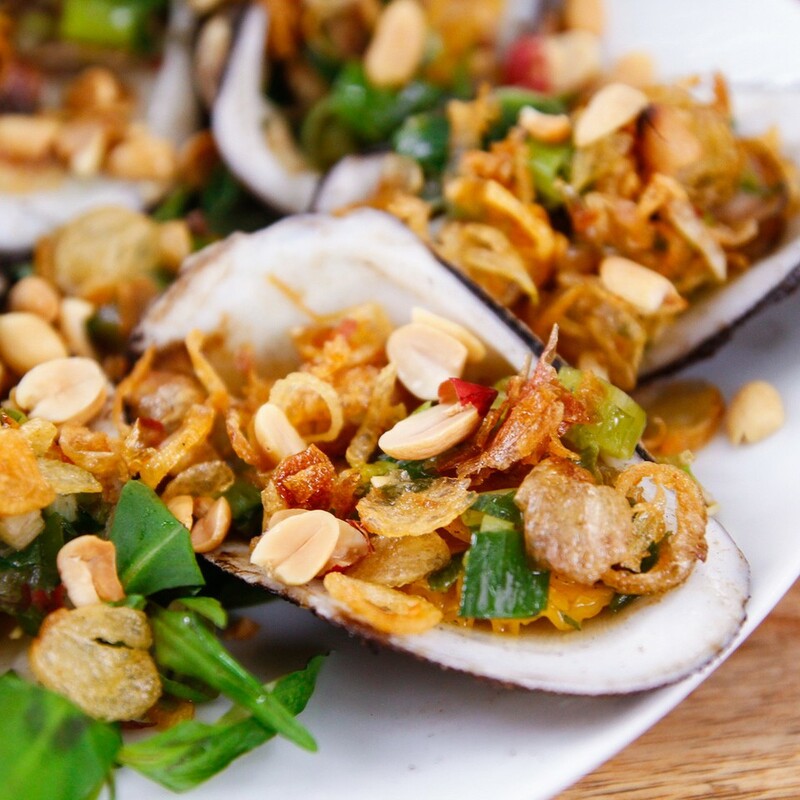 It is also a striking difference between Saigonese and Hanoian, while the later tends to spend the evening gathering with family members around a cozy home cooked dinner, Saigonese feel eager eating out with family, friends or colleagues. That explains why Sai Gon feels like one gigantic, open-air restaurant in more favorable weather conditions. Every day, tens of thousands of street-side eateries offer up delicious, cheap food in an informal environment on the city’s sidewalks. Eating street food is without doubt the best thing to do in Saigon. 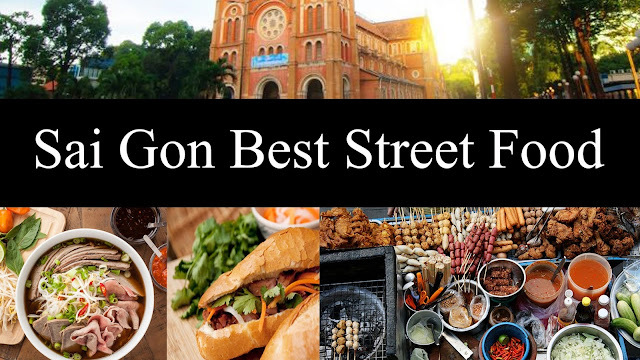 Here are my favorite street food in Saigon. The very first dish I enjoyed right after waking up in Sai Gon is Hu tieu Nam Vang. This small stall on Duong Quang Ham street, Go Vap district sells Hu tieu for breakfast and snails in the evening with a large number of frequent customers. 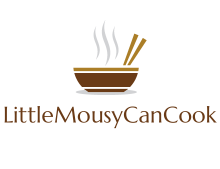 I ordered Hu tieu bo kho (Beef stew rice noodle soup) for me and Hu tieu muc (Squid rice noodle soup) for my friend. 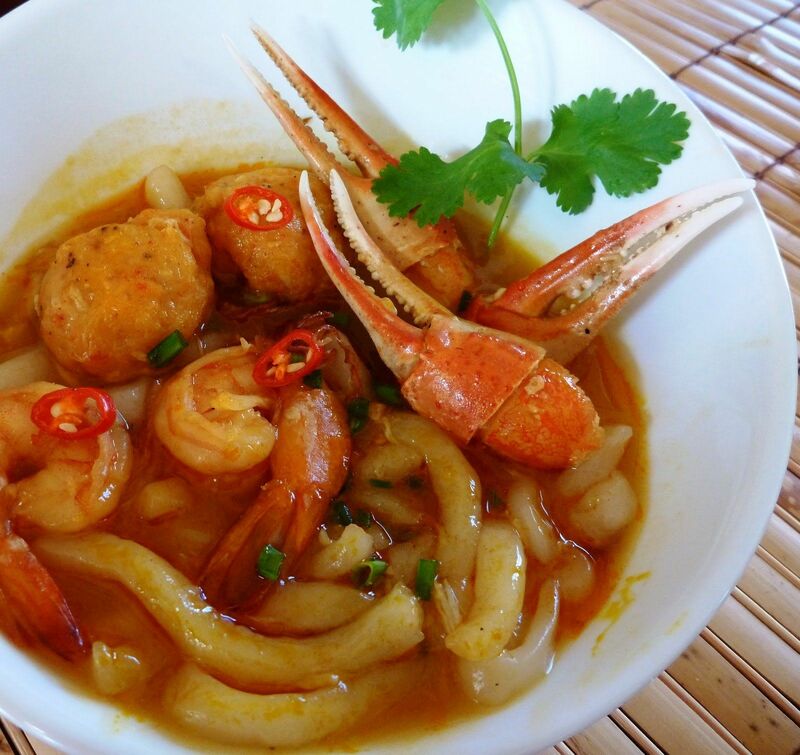 Both of us feel excited with the crunchy seafood and well-cooked beef stew offered, and especially super sweetness and freshness of the broth. The owner was also very nice when serving and providing us with helpful advice to grab a taxi. We started feeling a warm welcome from the local people here. 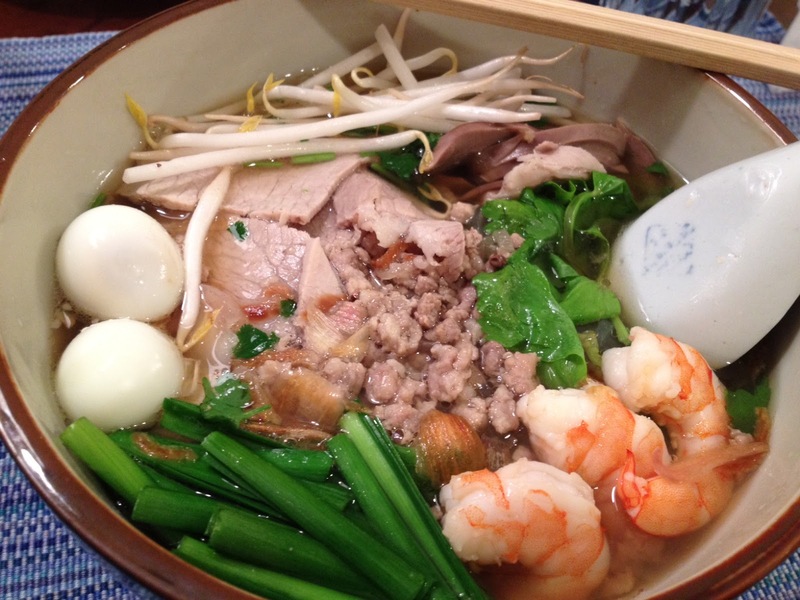 To be more specific about the dish, Hu tieu is known to originally come from Cambodia, and in its simplest and purest form, it is a soup, normally made with pork bones, and served with a variety of different types of noodles. 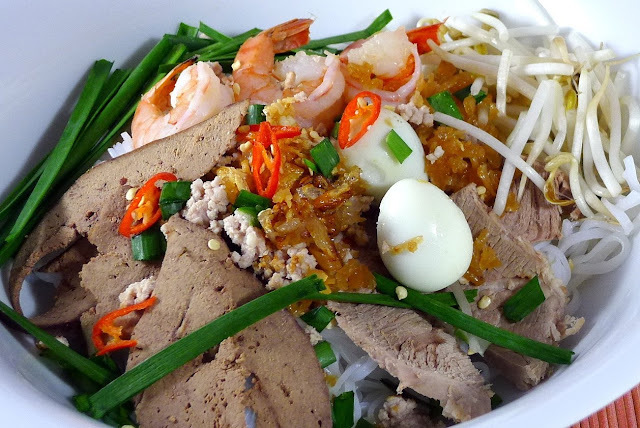 Nam Vang is the Vietnamese word for Phnom Penh, the largest and capital city of Cambodia, which explains why Hu Tieu Nam Vang is translated into Phnom Penh Chinese noodle soup, a dish that has roots in both Cambodian and Chinese flavors. 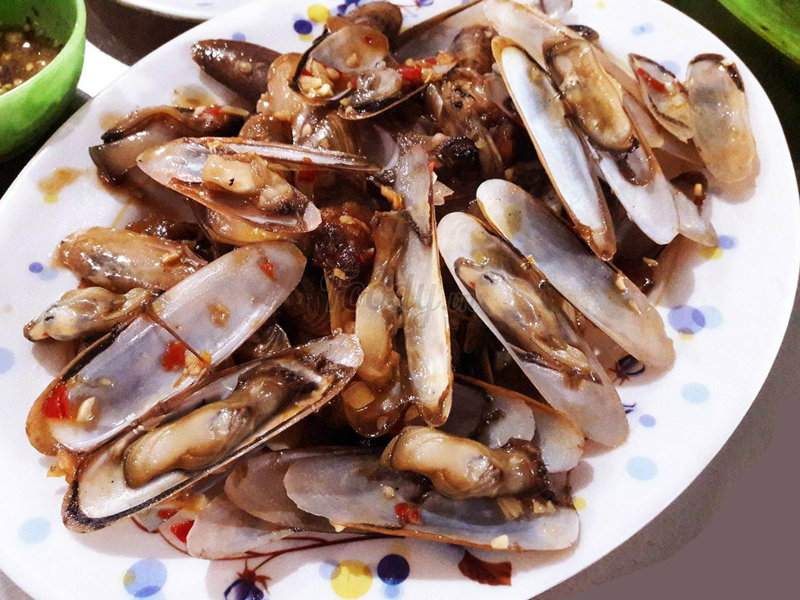 Saigon Snail is very different for Roadside snail of Hanoian in the way that the snail mainly comes from the sea and there is no room for steamed or boiled snails served with flavorful dipping condiment. Instead, Saigon snail is very diverse in types, including but not limited to, roasted sweet snails with tamarind sauce, mud creeper stirred in coconut milk, horse snails with cheese, fried razor shell with chili powder, stirred in sweet spicy sauce, topped with roast peanuts and many other versions of snails with numerous flavors! Oc Dao, Oc Thuy, Oc Beo, and even The gioi Oc (World of snails) are among the most famous snail restaurants in Ho Chi Minh city with hundreds of guests every evening. Customers sometimes have to wait in line until those who having meal finish and leave the table for their turn. A bustle landscape of so many people eating and drinking in snail stall is difficult to be found in other cities. Here, people love snail – a trendy street food of young Vietnamese. It may not be necessary to remind one fact that we have arrived in Saigon, the southern city of Vietnam, which is very close to the largest rice paddy field and abundant fruit gardens of the west region, owning to tropical climate. In Saigon, fruits of all kinds are sold on the street. You can easily buy a glass of authentic orange juice on Dien Bien Phu street, or a giant glass of sugar cane with only 5,000VND. Here, chill fresh coconut is especially available to help anyone dying of thirst after travelling a long mile. The beautiful smile of the street vendor and the extremely coolness of every fresh drink is the best thing to experience ever. 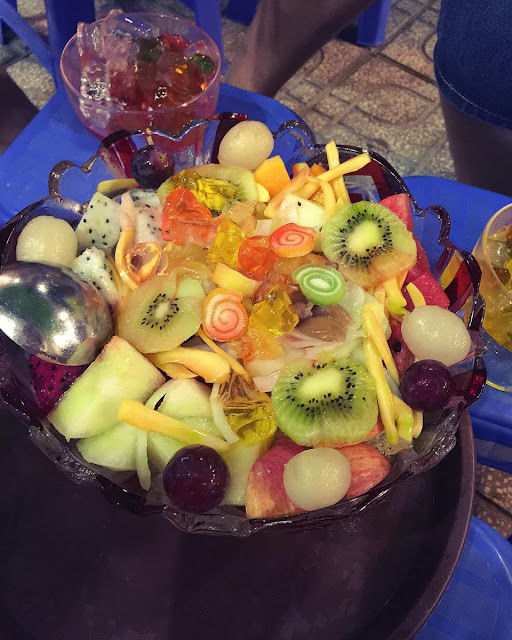 Fruit bucket defines a large bowl or bucket of fruits with syrup, jelly, yogurt or milk and crushed ice. All such fresh things well combine and make a perfect fruit mix. With about $1.5, you can eat water melon, papaya, longan, avocado, dragon fruit, etc. You also can spend money having fruit smoothie whenever you want on the river bank in windy day. One of the most favorite places to go when the sun goes down is Turtle lake. 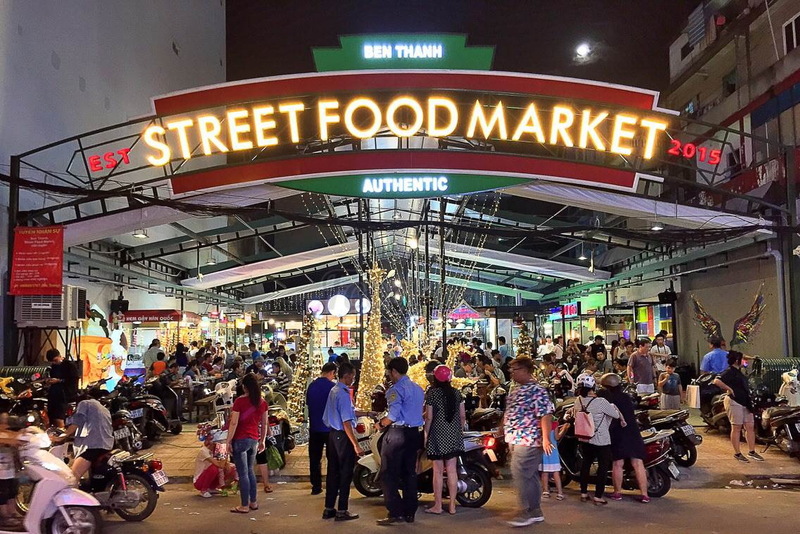 Located right within central Saigon, the lake is home to dozens of street food snack vendors that set up shop, and make snacks for the hundreds of young Vietnamese, both groups of friends and families, that come to hang out and socialize. Among popular dishes, the two most outstanding ones are Banh trang tron and Banh trang nuong. 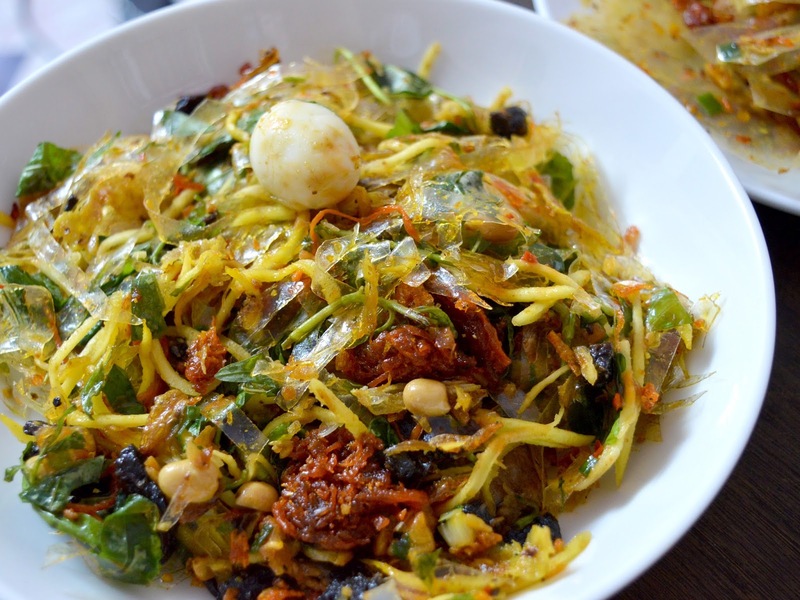 Banh trang are Vietnamese rice paper sheets (the same ones used for summer rolls), and banh trang tron is a snack salad made with strips of dry rice paper mixed with hot sauce, slivers of green mango, quail eggs, strips of dried squid, and all kinds of random goodies. 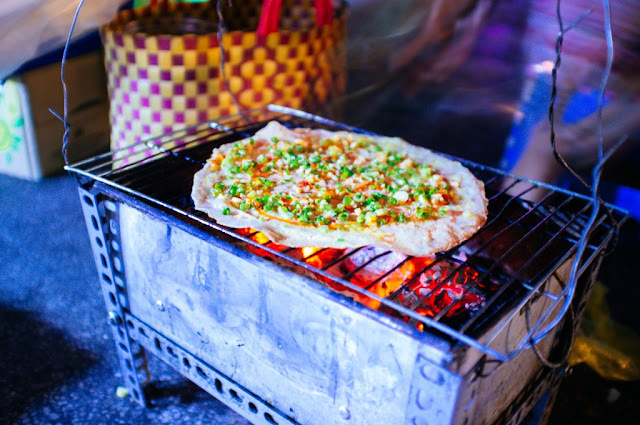 Banh trang nuong, on the other hand, is also made with rice paper, but is grilled like a pizza crust over charcoal, topped with a quail egg, chili sauce, dry pork, green onions, among other things. 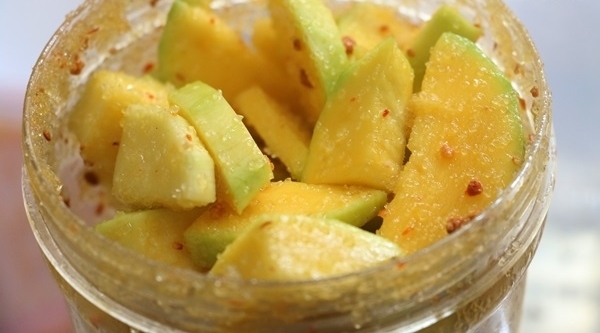 These snacks after diner go well with coconut – mandarin juice, lime juice for an ideal cool night hanging out with friends. This is my favorite breakfast in Saigon. 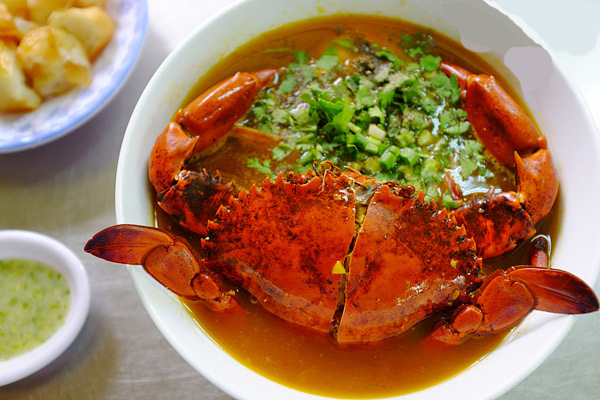 You hardly see crab soup sold as street side food but appetizer in restaurant in the northern region but in Saigon, with 10,000VND (5 cents), you can easily have this bowl of soup with much crab meat, coriander, red pepper, quail eggs and back thao egg (duck egg soaked in herbs). A bowl of this soup is not surely enough for man’s stomach until noon, however, the crab soup hanger where I ate in Dakao market, no. , Dinh Tien Hoang street, is located next to a very special dish of the day, Banh tam bi (Pork and coconut cream noodles) which makes me feel quite enough for the whole morning. 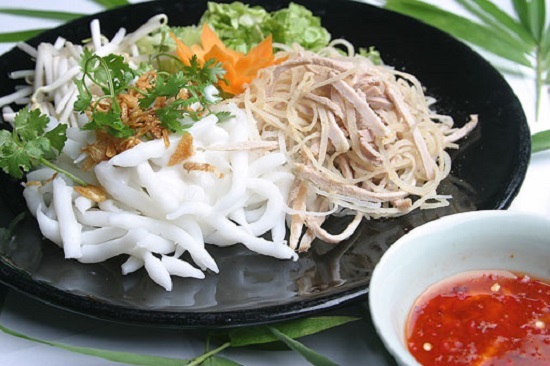 This home-made dish is a southern Vietnamese specialty made of thick rice and tapioca noodles, tossed with herbs and pork, and drenched in thick coconut cream dressing. A plate of banh tam mi is enough to wake up all of your senses. Wow, another member of the cake family, Vietnamese sizzling crepe. 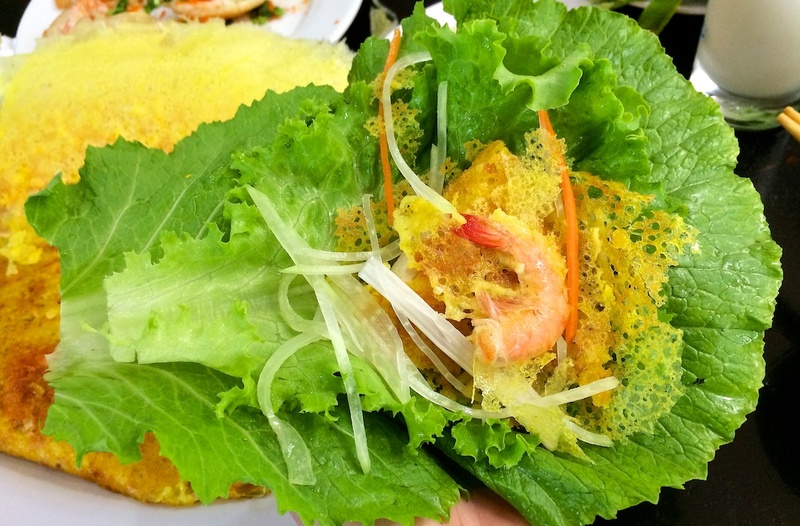 I bet that banh xeo in the south region is of the best in the whole country with bright yellow crunchy crust, fresh shrimps and indispensably bean sprouts. The dipping sauce is also sweet enough, light and well combines with the crepe. 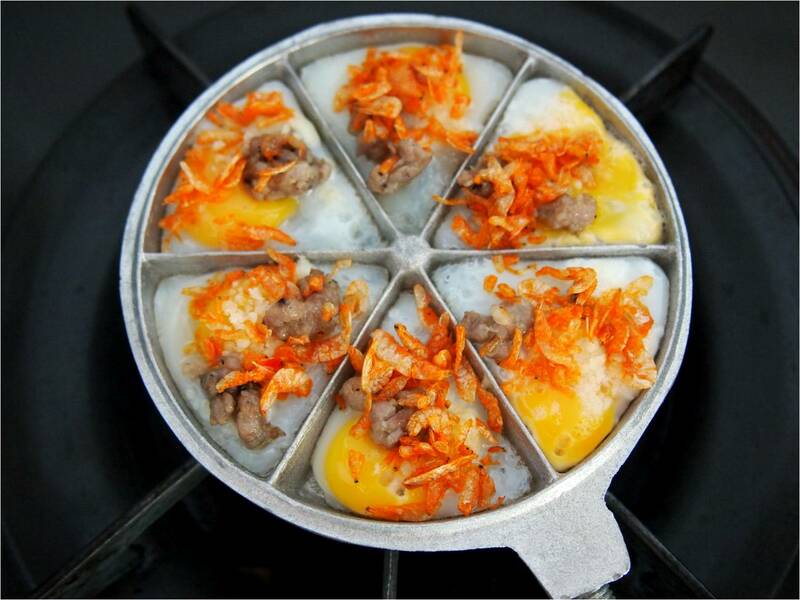 Don’t miss to visit the best banh xeo in 204 Nguyen Trai, Pham Ngu Lao street, District 1, where you can enjoy the best banh xeo ever. There are many kinds of banh canh in Ho Chi Minh city, namely Banh canh ca loc (Snake head fish noodle soup), banh canh ghe (crab thick noodle soup), banh canh Ben Co, banh canh vit (duck noodle soup), banh canh tom nuoc dua (shrimp and coconut fresh noodle soup), banh canh gio heo (pork hock noodle soup) and so on. Among all of them, I like crab thick noodle soup the most and I gave it a try in an always crowded one along the river side on street. The crab was very sweet with thick meat and stunning broth. 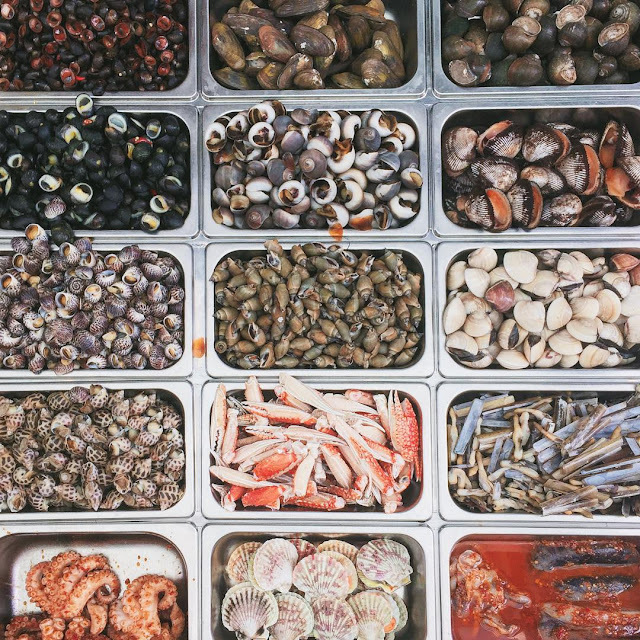 Having seafood, clean and delicious is the most interesting experience ever in this bustle city. 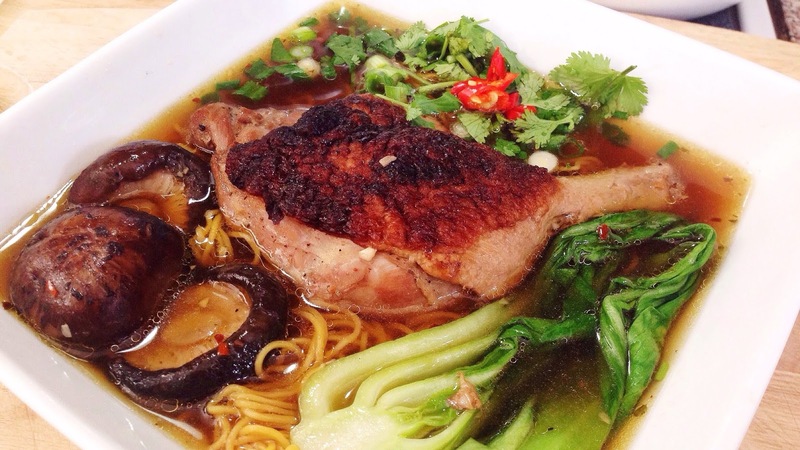 Vietnamese Duck and Egg Noodle Soup (Mi Vit Tiem) borrows heavily from Vietnam’s northern neighbor. The trick is cooking the duck legs until tender (but not mushy), mahogany brown, and deeply seasoned. 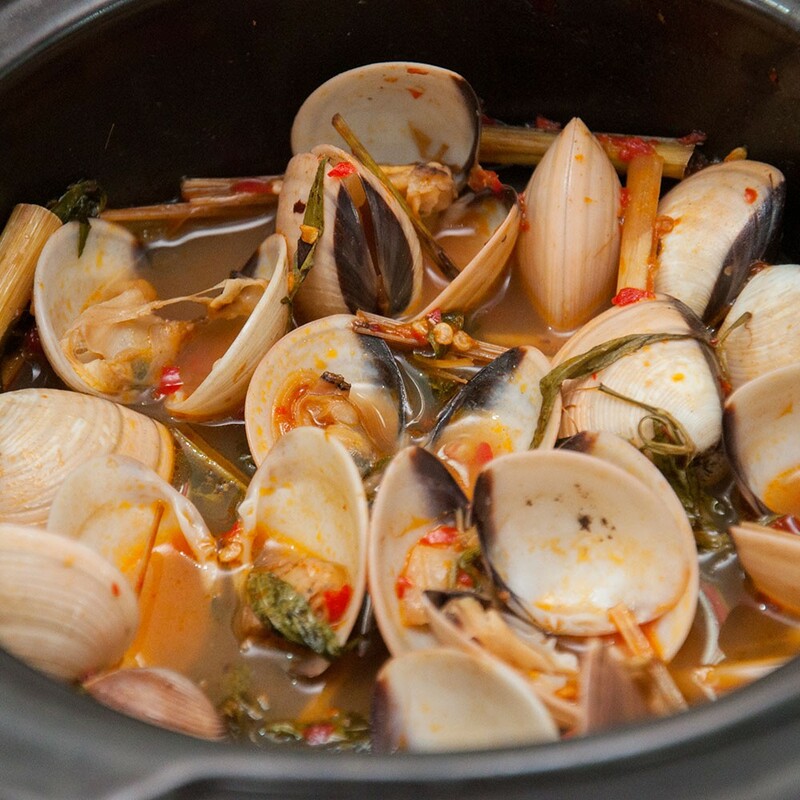 The traditional approach is to marinate them, flash fry them for color, and then simmer them in the broth. Some cooks even refry the legs right before serving. Traditionally, the duck leg is served whole on the side for diners to attack with chopsticks and spoons. Since that is hard to do, even for a native chopstick user like me, the meat is often sliced and served in the bowl. 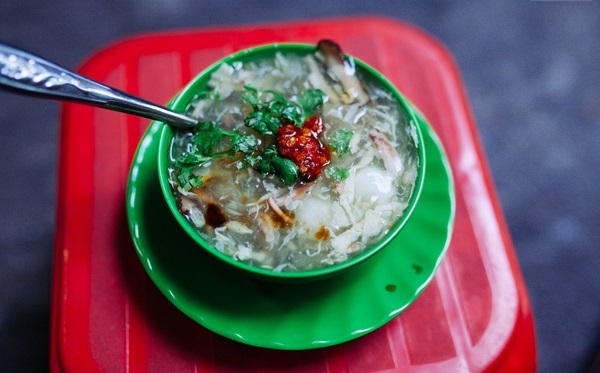 In Ho Chi Minh city, you can visit Luong Ky My Gia or Hue Ki Mi Gia to enjoy the most authentic Vietnamese braised duck soup. Saigon is full of sunshine during the days but very cool at night thanks to the river flowing through the bustle city. No matter how hot the weather, it will never diminish our desire in searching for amazing street food stalls, taking a seat outside in quite hot a day and listening to life stories of local people. Indeed, Ho Chi Minh city is a metropolitan where you can hear Hanoi, Thanh Hoa or Quang Nam accent but once gathering around here, people are so nice and thankful that you may be surprising at first but grateful for the way you are cared then. 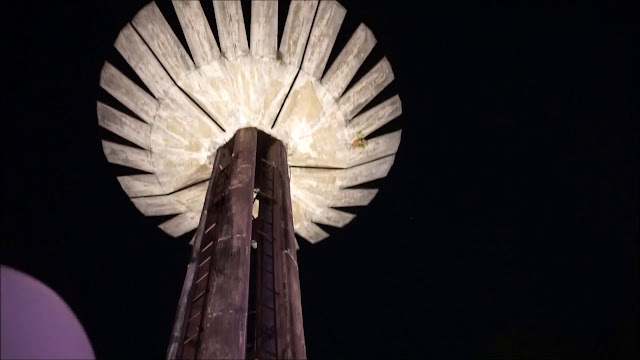 That explains why the city that never sleeps is so charming to both the locals and the foreigners to visit and live in.